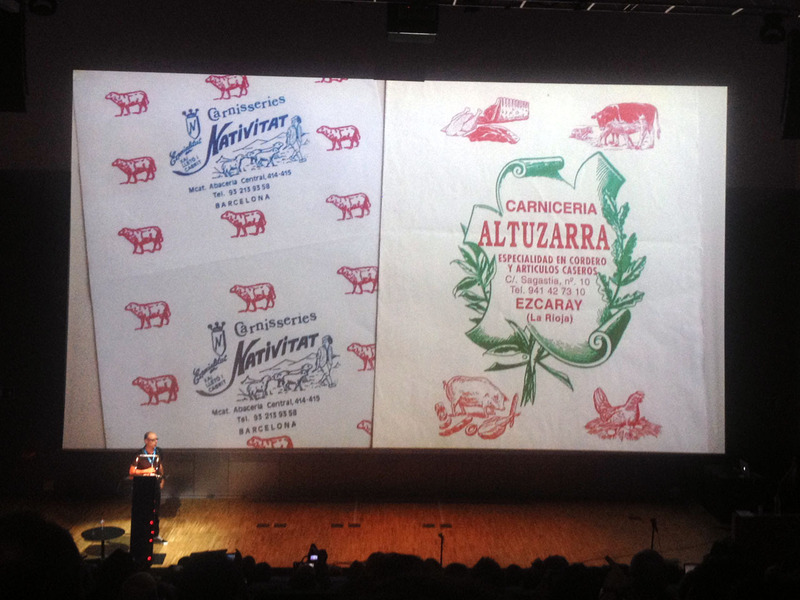 The Typographic Dialogues – initiated by ATypI and continued during the coffee breaks, in the evenings and even on the Barcelona beach – brought together type aficionados from all over the world. You can hardly get any more intercultural than this! If you are the conscientious type and haven’t done already, you might want to read part 1 of my report first (type design tools and technical issues), as well as part 2 (teaching type design). 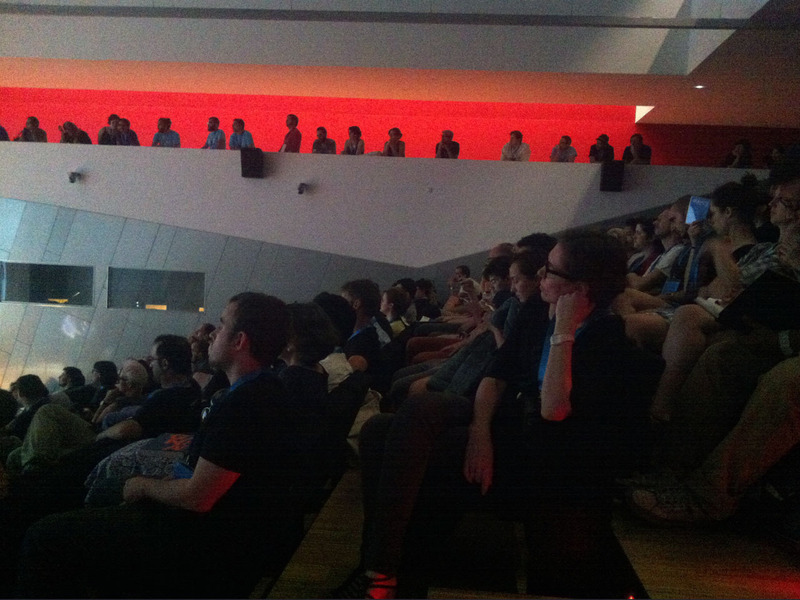 This third part focuses on some striking intercultural aspects of the conference. We start this installment with a very specific typo-cultural topic – and one of my absolute favourite talks from the conference. 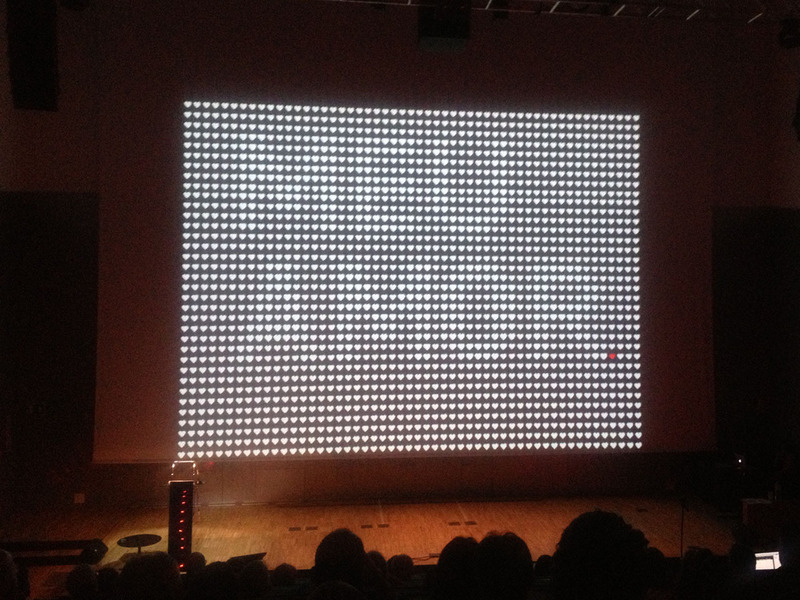 Getting acquainted with The Geminated El (ĿL), as presented in depth by Dr. Oriol Moret-Viñals of the Faculty of Fine Arts, Barcelona University, was a true pleasure. Originally the geminated el was a single character formed by two els and a middle dot between them. The Ls were as close to each other as possible, like in the Spanish double L (for example in ‘calle’). The geminated L (‘ŀl’ or ‘ĿL’) is exclusive to the Catalan language, similar to the Eszett (‘ß’) in German. The Catalan geminated el should be treated as a single character, formed by two els with a middle dot. There was no problem in metal type, as there was one sort for the geminated el. 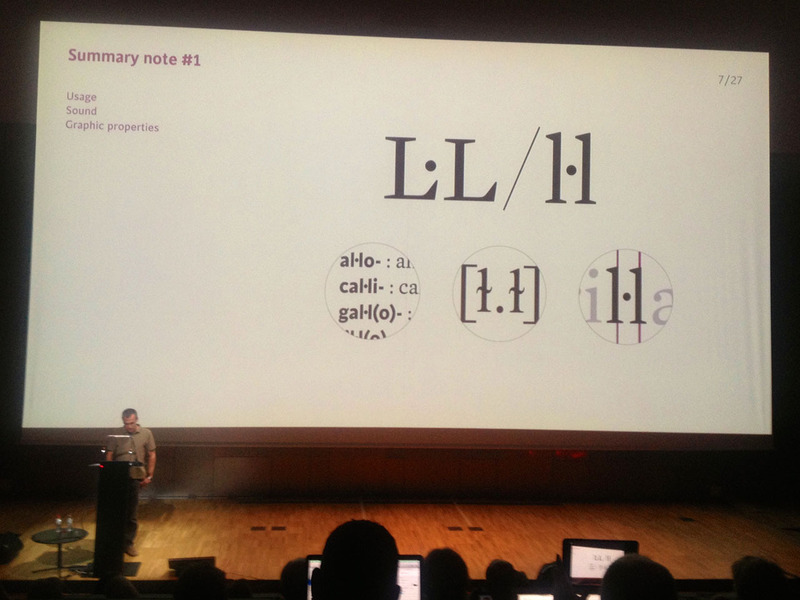 Yet the confusion began when the character ‘l·l’ was broken into ‘l·’ or ‘·l’ in due to the monospaced aspect of the typewriter, and subsequently on the computer. In 2004 a group of typography professionals set out to restore the original geminated L as a singular character in the digital world. Oriol Moret-Viñals – a singular character himself – gave us an excellent, well-structured overview of the history and development of the geminated el and its cultural implications. He focused on encoding and typographic construction as a starting point – or better: “continuation point” – for reinstating the character. 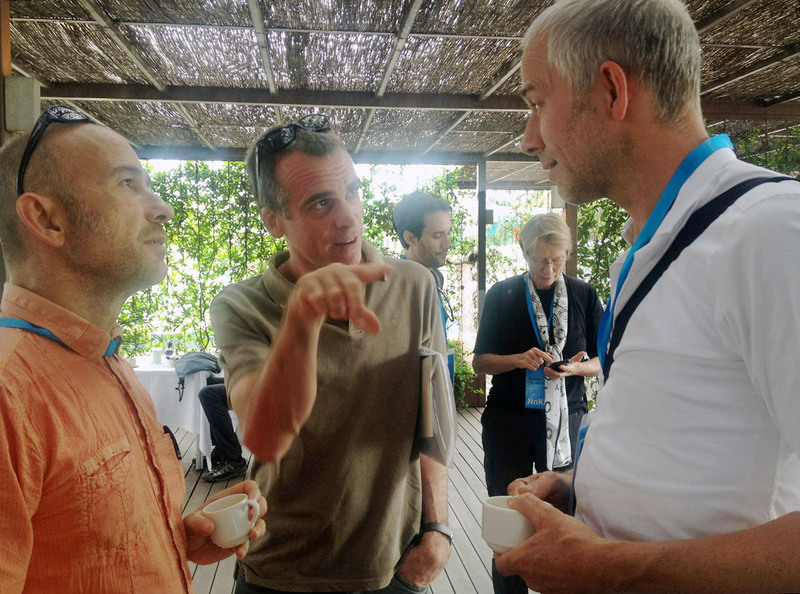 It was impressive to witness how serious this issue is, not only to Oriol and a group of researchers and type geeks, but also to a large and important group of native speakers. Dr. Oriol Moret-Viñals and Marc Antoni Malagarriga-i-Picas (Catalan names! 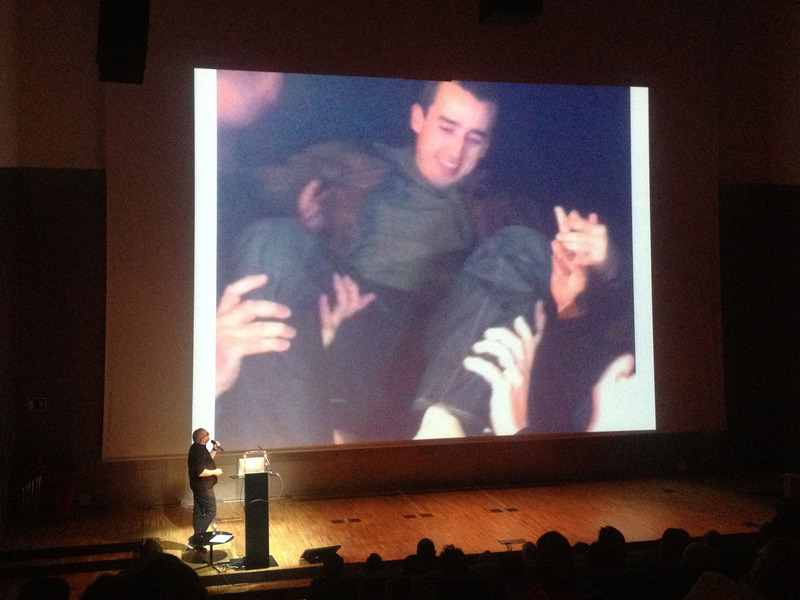 ), both of the Barcelona University, explain the importance of the geminated el to Luc(as) de Groot. Catalan is spoken by 8 million people. It is the second most commonly used native language (after Spanish obviously) in Catalunya, a region in north-eastern Spain, plus smaller parts of France. The authorities invest in promoting the Catalan language, both in their region and other territories. It is the official language of Andorra, and a co-official language of the Spanish autonomous communities of Catalonia, the Balearic Islands, and the Valencian Community where it is known as Valencian. It has a semi-official status in other parts of Spanish communities like Aragon and Murcia. However there seems to be no official acknowledgement of those facts, even though you encounter bi- or three-lingual signs – Spanish, Catalan, and sometimes English – in Barcelona, even as soon as you arrive at the airport. 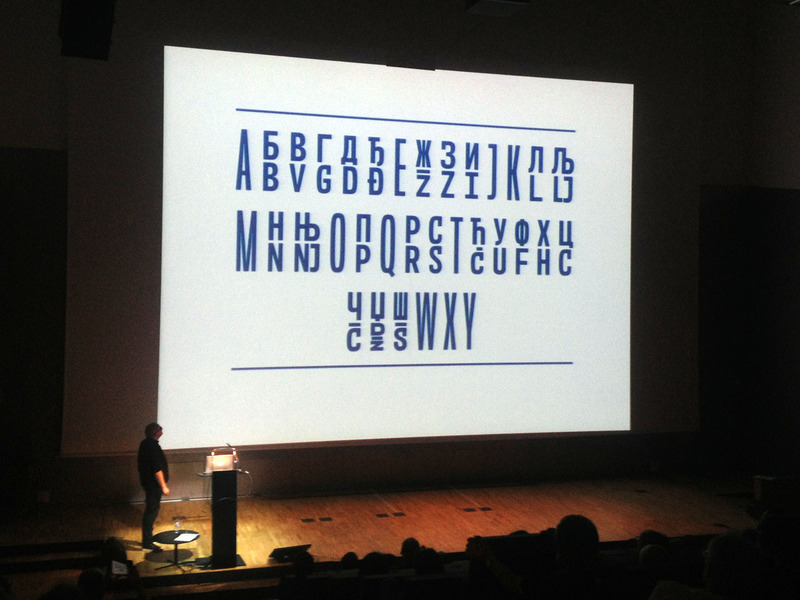 Oriol’s concluding statement was a sincere request: “No Latin typeface could be complete without a geminated el”. 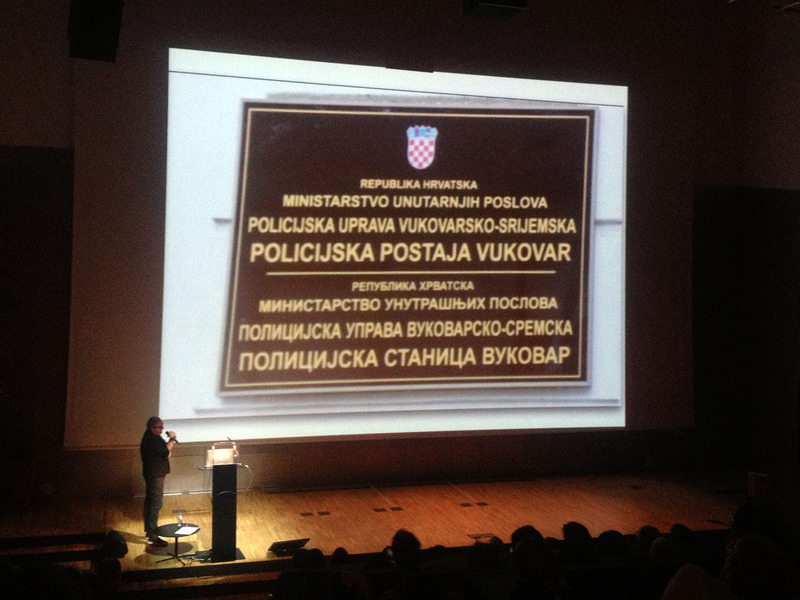 The topic of (missing) official acknowledgement allows me to segue from southwestern to southeastern Europe into the impressive presentation by Nikola Djurek from Croatia. Before introducing us to his “typographic system that weds Latin and Cyrillic scripts” based on a phenomenon known as “the Balkan sprachbund”, the Typonine founder pictured the tremendous upheavals in the area caused by the Russian attempts to impose Cyrillic letters. 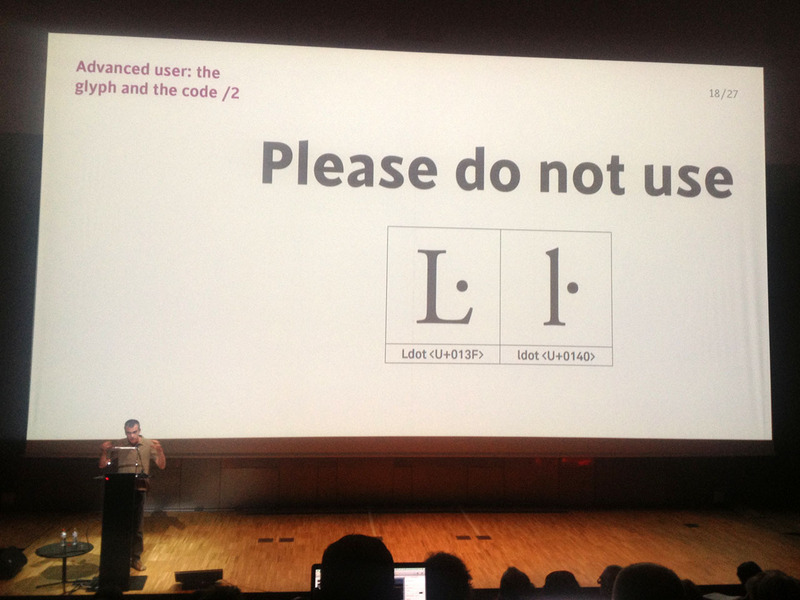 Another message, loud and clear to many Eastern Europeans: Cyrillic letters are not needed. First let me clarify what Sprachbund means. It is a German term used to describe neighbouring languages that “merge in sound and grammatical features”. Alas in the Balkan nothing seems to really merge, at least not peacefully. Not even in type. Nikola Djurek subtly sketched what happened in the Balkans. This makes Nikola Djurek’s system so interesting. Without ignoring history and in a respectfulful and serious manner, he proceeded to identify the features shared by South Slavic language systems like Bosnian, Montenegrian, Croatian and Serbian. Is it possible to peacefully harmonize different regional script systems if the regions themselves are not? Throughout history six scripts were used in the region, among them Latin and two kinds of Cyrillic. 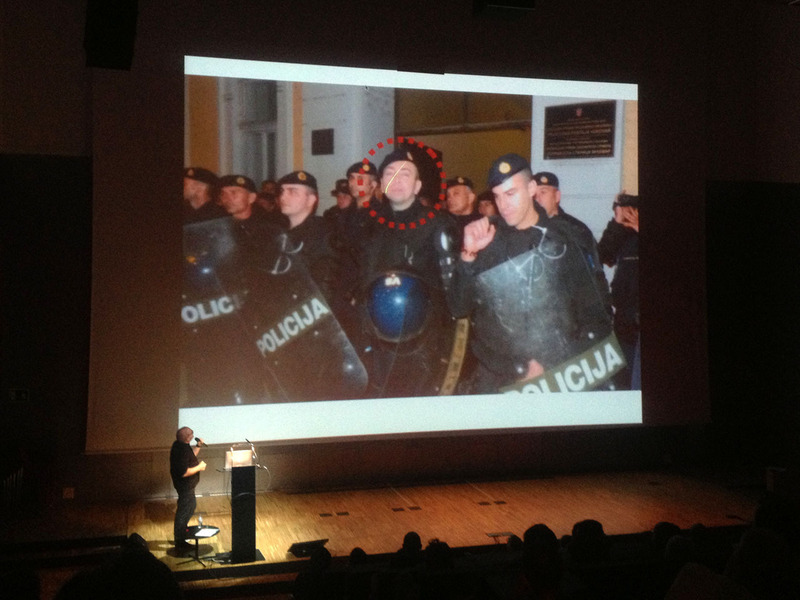 This was however not without bitter and bloody conflicts: Nikola showed us pictures of heavy demonstrations against the Cyrillic script happening in the city of Vukovar in eastern Croatia. When the official instances decreed Cyrillic should be the official script and Cyrillic signs were installed accordingly, the general population screamed bloody murder. People in Croatia violently protesting official regulations that make the use of the Cyrillic script compulsory for their region. 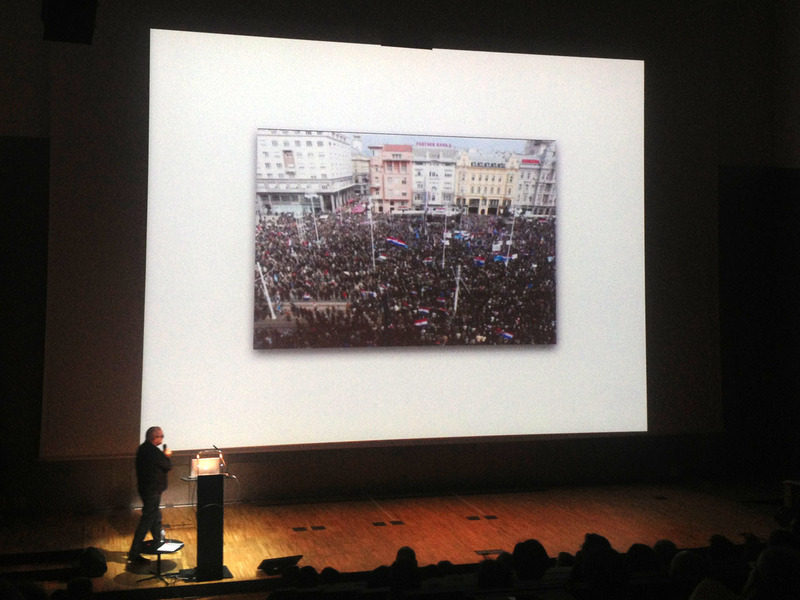 “Croatians don’t need Cyrillic” is how Nikola Djurek dryly summed up the predominant mood. To put this in context: Vukovar, with a population of 27,000, was heavily damaged during the Croatian War of Independence. The suffering of its population has been compared with the Siege of Stalingrad in World War II. A deep ethnic divide between the Croatian and Serbian populations stems from the heavy conflicts, which gave birth to a deep-rooted sense for the need to defend against repression – even among officials. … turned out to be the hero who helped remove it – worshipped by the population, but unemployed soon afterwards. 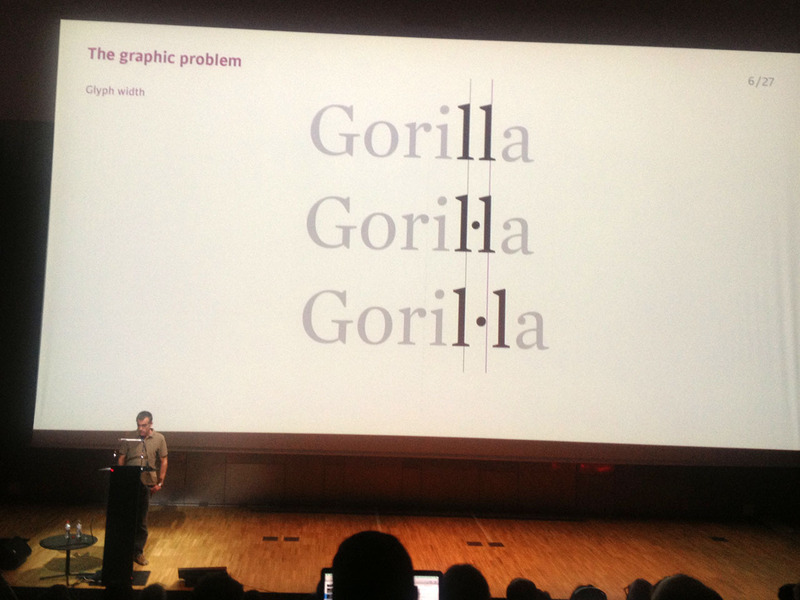 See also the interview with Nikola Djurek on I Love Typography. 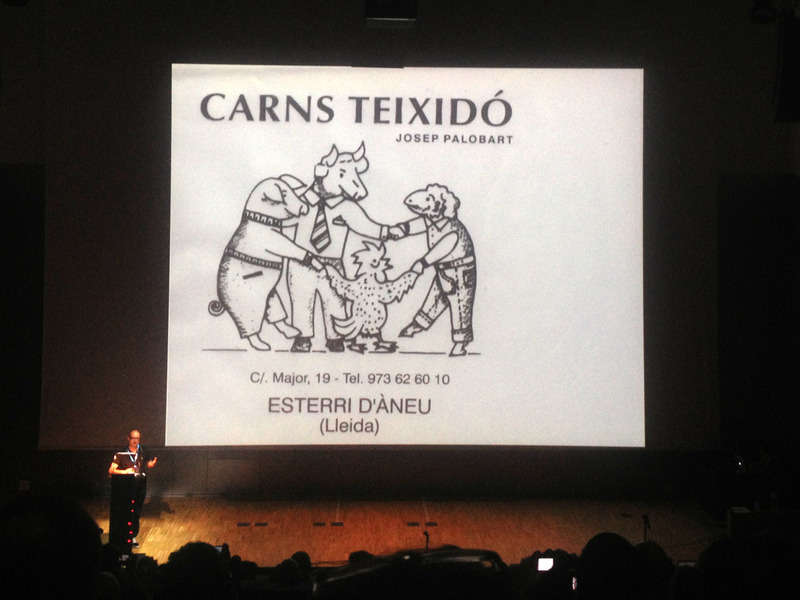 A much more light-hearted approach to cultural differences were the “Typo Tapas“ in Barcelona, a series of short, visual presentations garnishing the conference days. Thomas Maier (who already shared his technical knowledge with us; see part 1 of my report) presented the street fonts collected by his friend Martin Ulrich Kehrer. With countless pictures compiled in two beautiful books, Kehrer compared shop front lettering and signs in the streets of Barcelona and Vienna. 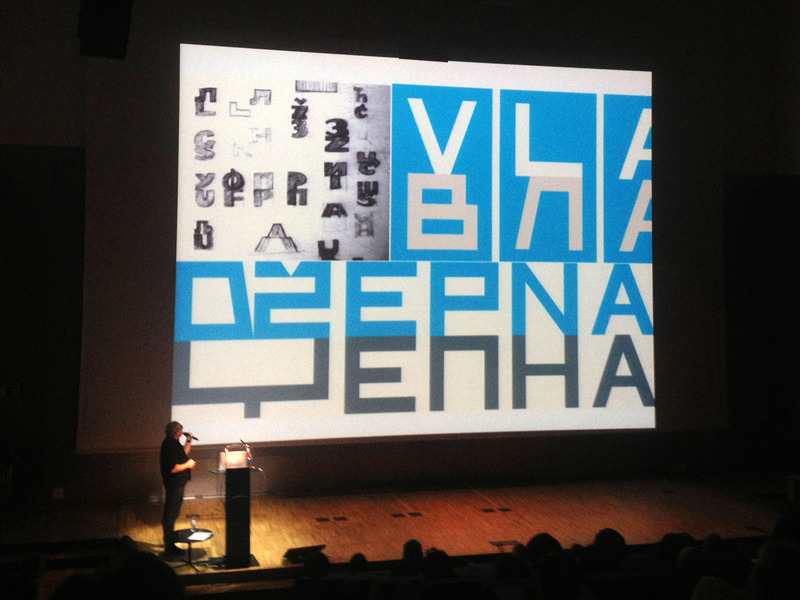 In his slides Thomas Maier alternated between the two cities and made us experience two different “urban alphabets” simultaneously. This simple, visual device clearly demonstrated that letters are cultural catalysts. And the results are beautiful – the photo book Stadtalphabet Barcelona (An urban alphabet of Barcelona, Alfabet Urbà de Barcelona), the sequel to Stadtalphabet Wien (An urban alphabet of Vienna), features a text by ATypI Barcelona co-organiser Andreu Balius and is set in his typeface Barna, available from his foundry Typerepublic. 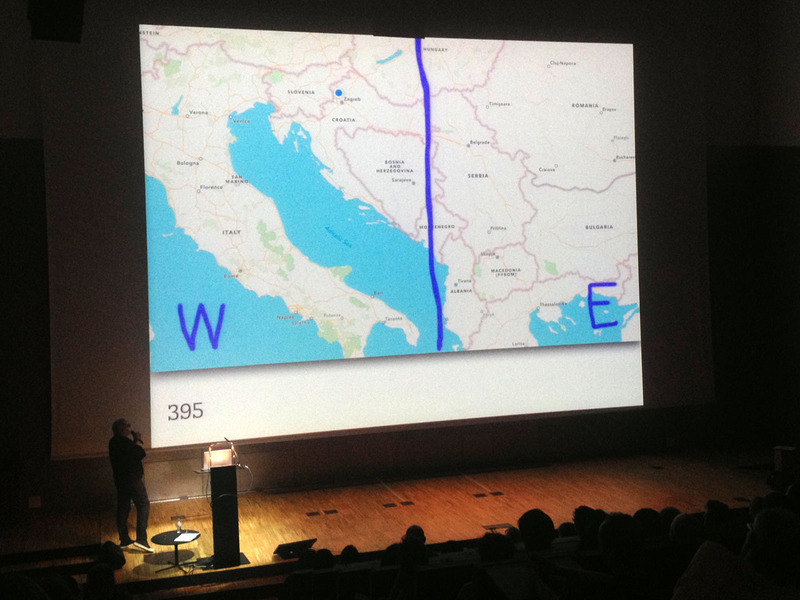 Paulo Moretto’s visually rich talk at ATypI 2014 was actually not that much of a “talk”. Paulo had selected 200 posters from a total of about 8.000, all designed in his home country Brazil. He quietly stood in the shadow at the side of the huge stage, barely saying anything while flicking through the slides. This was a nice change of pace as it gave the audience a moment to wind down and allowed them to indulge in the mostly wordless spectacle. 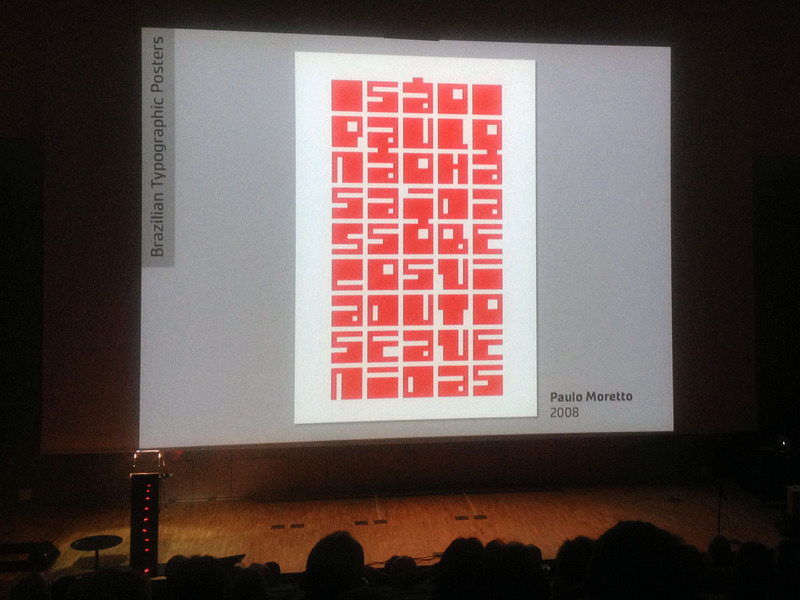 The visual dialogue between typography and image proved to be “sometimes a monologue”, as Paolo commented, and was often very sophisticated. The audience appreciated the hand-made references, the figurative minimalism, and all those other beautiful impressions that eventually turned out to be a teaser for what we can expect next year. 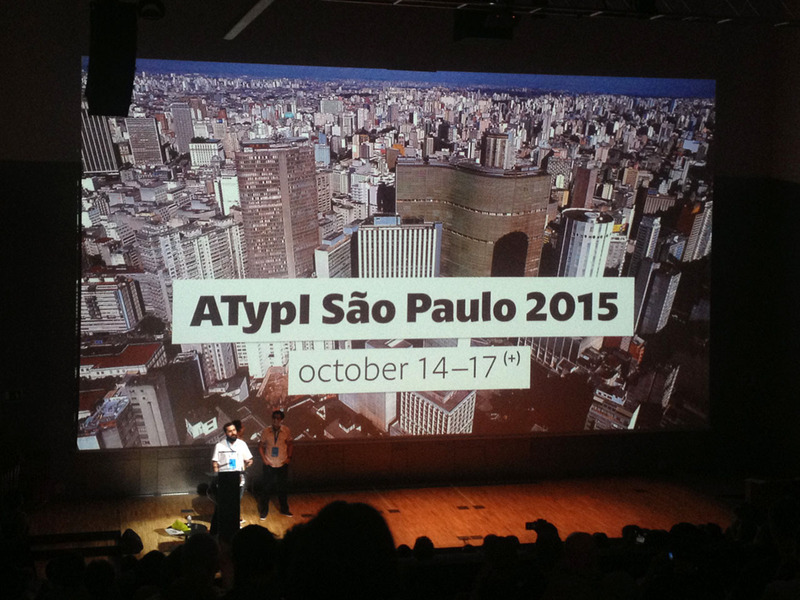 It was announced that ATypI is going to be held in – guess where – São Paulo! Adding some Portuguese to Spanish and Catalan: mi amor /// meu amor /// meo amor. 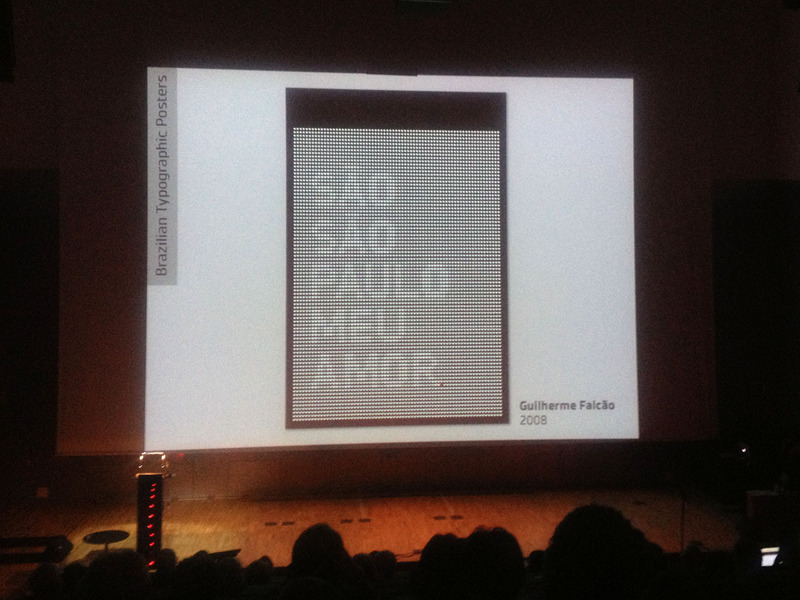 Suddenly it made sense that no less than eleven Brazilians took part in this year’s ATypI conference – “more than the Dutch mafia” as a beaming Henrique Nardi proudly remarked during a coffee break. 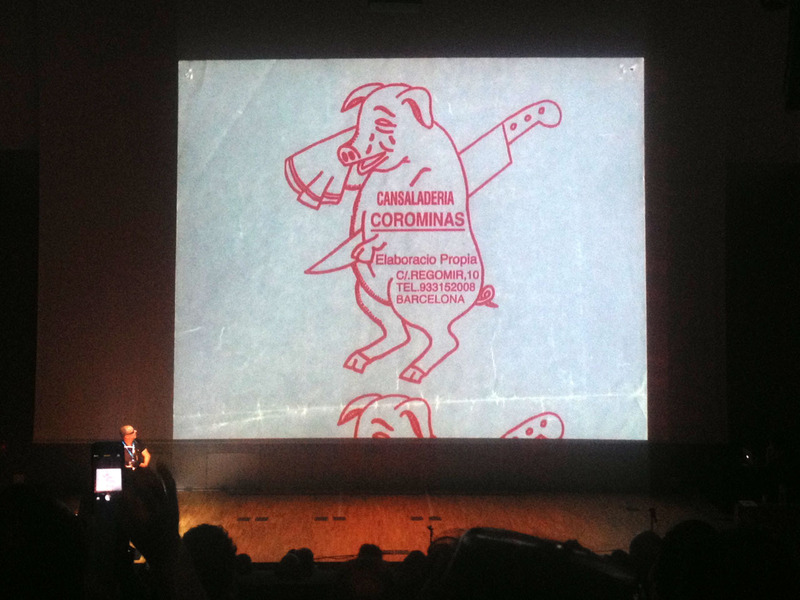 Next year will be the first time the ATypI conference heads to the Southern Hemisphere. Its 59th edition will take place from October 14 to 17, 2015, “in the fast-paced business-driven multicultural city of São Paulo, Brazil” as can be read on their website. The pictures of the city and of the venue were just breathtaking (Fundação Armando Alvares Penteado – or FAAP – one of the most prestigious higher education institutions). Save the date! So, where were we? Almost as colourful as the Brazilian posters (at least if you think of blood red), yet the biggest possible contrast with their sophisticated designs proved to be the DIY wrapping papers by Barcelonian butchers. Andreu Balieus granted us a peak into his delicious collection. He either seems to be a manic hoarder of these vernacular forms of art, or he must be highly addicted to Spanish jamón). 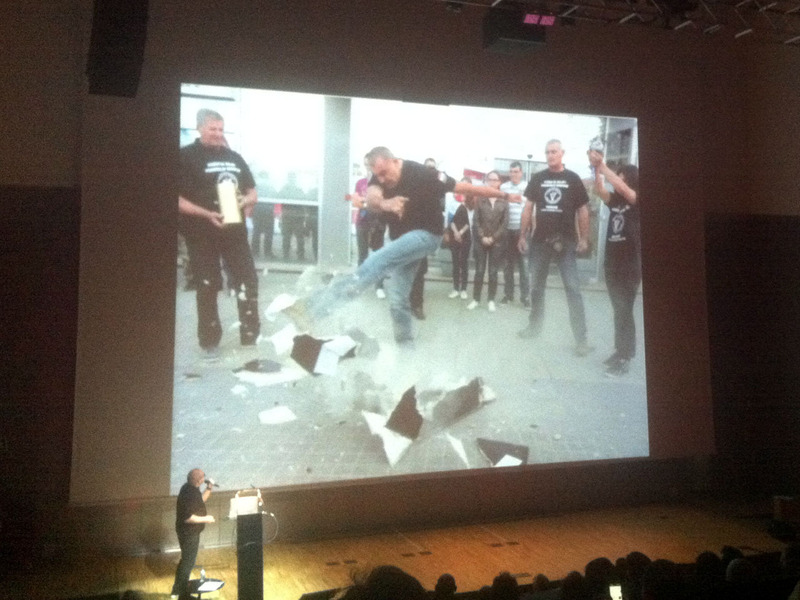 Many of the examples pictured stylised assaults to the lives of cows, pigs and chickens, thus threatening to disturb the more sensitive souls in the audience. 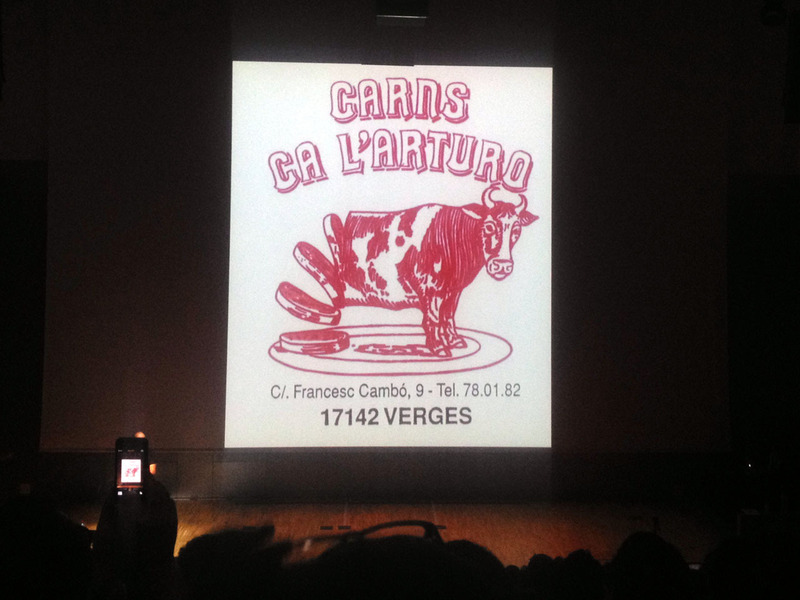 These “Typo Tapas” really were dripping with blood and gave us a better insight in the local graphic culture. Although, “local”? I guess if you walk around your local area with eyes open you too might come across similar examples. And what about starting a collection of, say, bags for pharmacies, or service stations, or – to accommodate the vegetarians – groceries? ¡Jamón, jamón! The predominant colour is obvious, the explicit nature of some illustrations quite shocking. Later on Señor Mario Eskenazi – visit his website to discover dozens of misspellings of his name and dozens of wonderful samples of his work – showed how he influenced the visual aspect of the streets of Barcelona. Amongst his personal favourites are obviously restaurants, like Ferran Adrià’s famous elBulli (closed and turned into a foundation) or the ROcca MOO, belonging to three BrOthers. 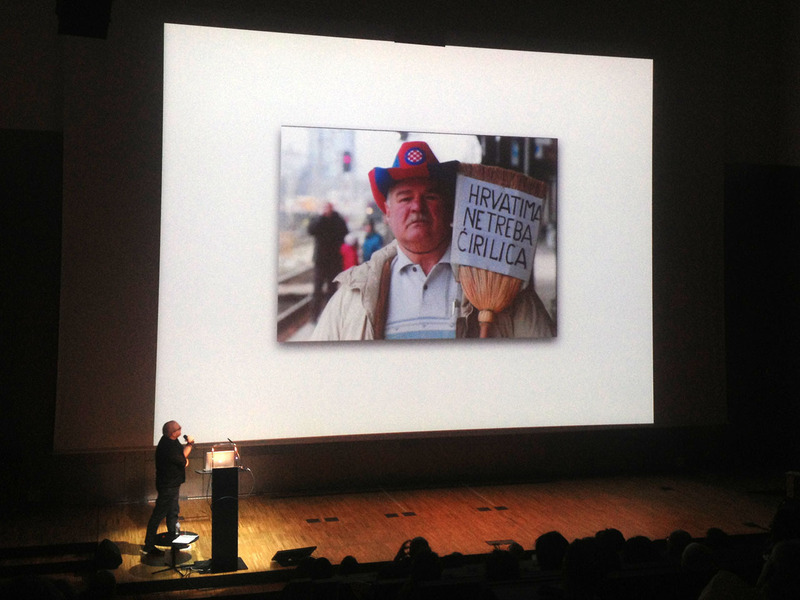 There were quite a few talks given in Barelona illustrating the fact that you can, in a way, “determine the cultural identity of a place” (and people of course) by the type you encounter. The Type of Place project gathers such examinations and tries to prove that there is a big possibility that the unique characteristics of communities, regions and cultural identities can be determined by looking carefully at local scripts and typographic form. There was much more type culture of course. 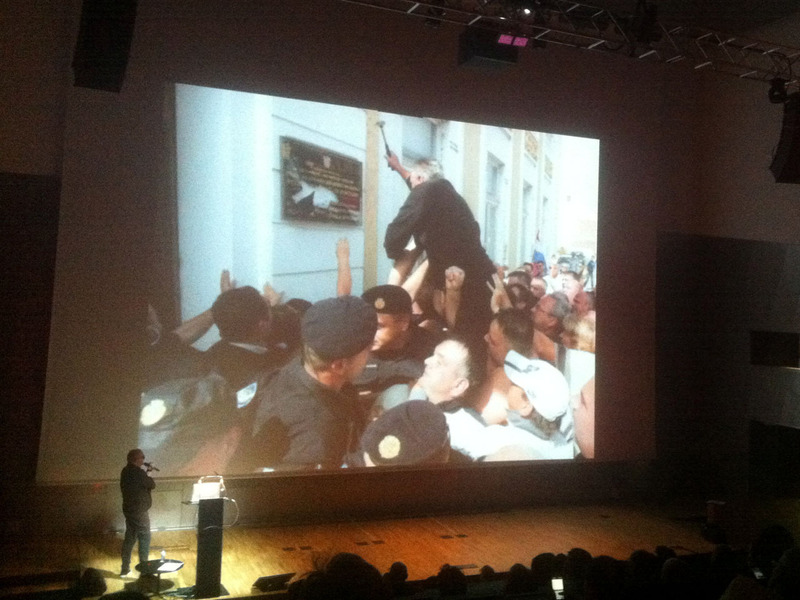 Boris Kochan presented the awarded projects from the wonderful Granshan competition. Liron Lavi Turkenich from Israel told the audience “radical anecdotes in search for solutions” which she faced when dealing with “Latinised Hebrew”. Rezan Gassas showed Arabic adaptations of global brands, addressing the issue of whether and how (or not) to translate existing logos for use in the Arabic world. This raised some questions which I am afraid I cannot sum up adequately. “What happens to type when it speaks Arabic” might be something to discuss further. 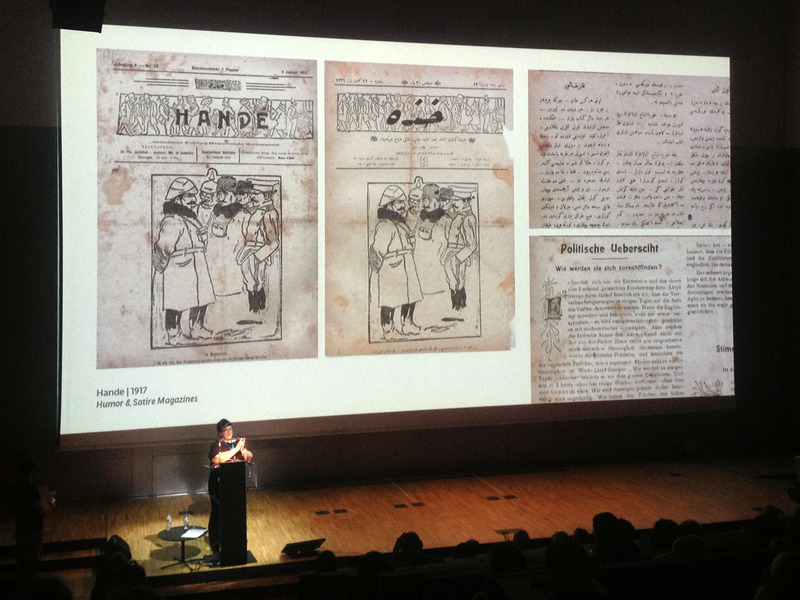 Özlem Özkal encouraging the integration of other nations’ script cultures (here showing German elements in Turkey in the late 1920s). Even “Umlauts” can be playful rather than a problem. 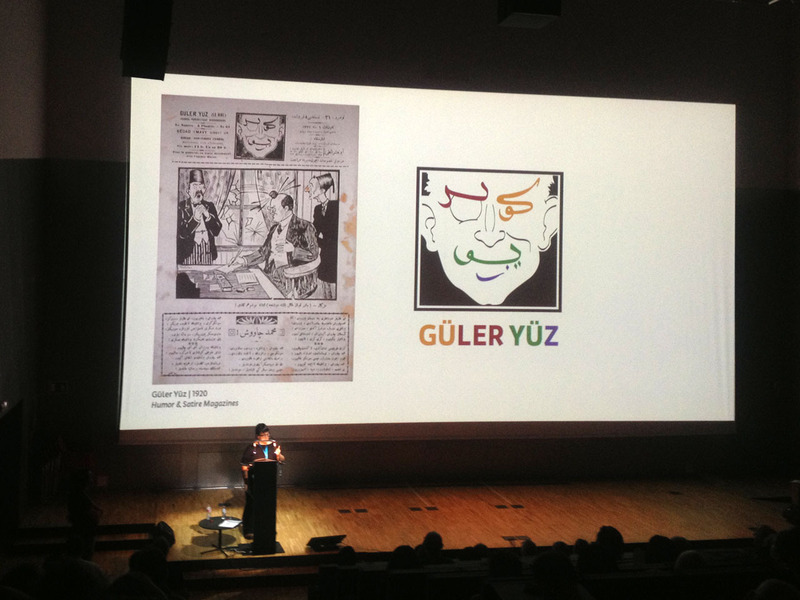 Dr. Özlem Özkal and Onur Yazıcıgil demonstrated how typography in Turkish print culture even integrated German influences after the 1928 Script Reform. 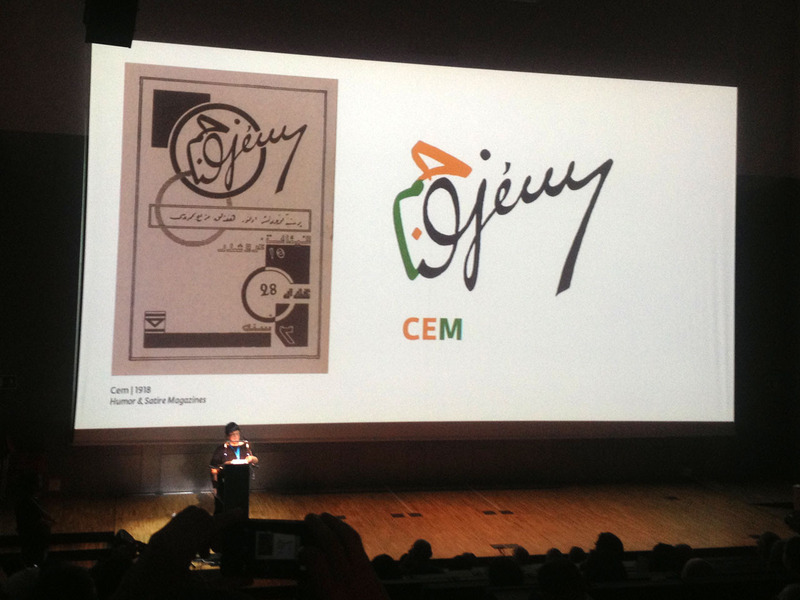 Like most ATypI members, they “believe that a stronger dialogue between today’s practice and the early efforts that transformed a set of symbols into a functioning media, will inspire, connect and encourage professionals and educators” – in Turkey, and ideally all over the world. 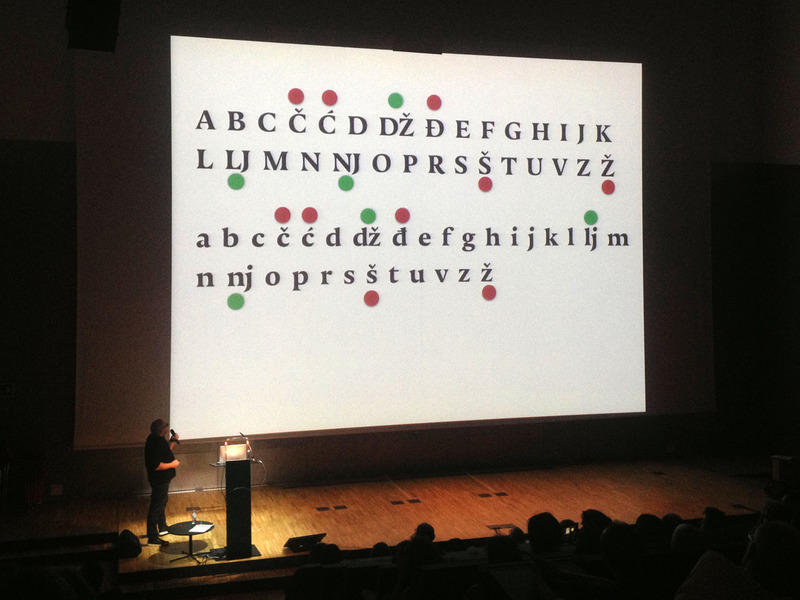 Consult the ATypI conference programme for further exploration! 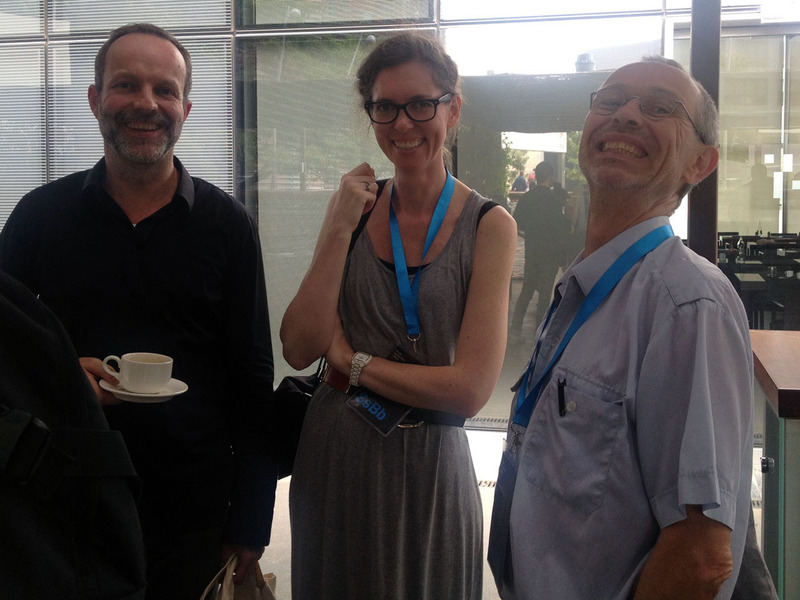 … and happy encounters in the breaks (here Sofie Beier with Danish colleagues).